Last week we looked at the various types of rifle actions available to hunters and target shooters. Before we more closely examine those actions, let’s study the rifled barrel and some of its history. Early long guns were smoothbores; in other words, much like today’s modern shotguns, they had no grooves in the bore section of the barrel. These early guns were also powered by black powder. Black powder, when burned, creates huge amounts of smoke and soot. After only a few firings, barrels need a thorough cleaning. Because of the sooty buildup and, being smoothbores, early long gun accuracy was not good; in fact hits beyond 50 yards were mostly just old-fashioned luck. Early on in the development of weapons, archers learned that by placing feathers (fletching) with a bit of a twist on the rear of the arrow shaft, the arrows would rotate in flight, be more stable, and much more accurate. Eventually, the same principle was used to create the rifled barrel. Spiral grooves were cut into the bore of a barrel; these grooves had a twist to them. 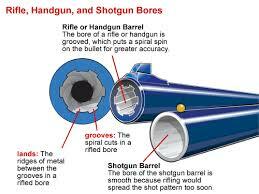 When the gun was fired, the bullet gained a rotational spin as it left the barrel. The spin, much like the spin of an arrow, stabilized the bullet flight making it much more accurate. Think of a football that is thrown by the Captain’s boyhood hero, Joe Capp. Capp, a great Viking quarterback, threw a lot of wobbly “wounded ducks,” whereas great passers like Payton Manning and Tom Brady throw really tight and accurate spirals. 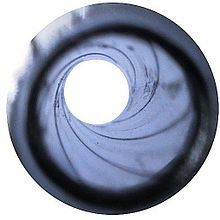 There are two types of rifling uses in modern firearms; traditional land and grooves, and polygonal. Most big game rifles use traditional rifling, while an example of polygonal rifling would be the type used in Glock® pistols. 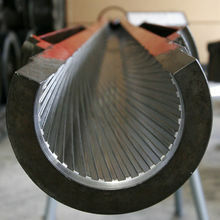 The twist of the rifling is measured in inches; for example, a 1 in 8 twist means that the bullet makes one 360° rotation for every eight inches of barrel length. Short fat bullets (e.g. .45 ACP) usually require less twist, something like 1 in 16, verses a long slender bullet (e.g. 7 MM) that might need a 1 in 8 or 1 in 7 twist. Longer bullets require more twist; this increases the rotational spin and helps stabilize the bullet for greater accuracy. Another element in increasing accuracy of rifle barrels was the development of more efficient projectiles. In the early 18th century, Benjamin Robins, an English mathematician, postulated that an elongated bullet would be more stable and thus more efficient in flight than a round ball. Old Ben was right. 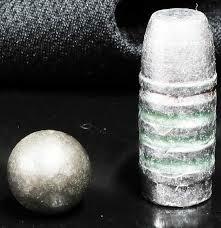 Claude-Étienne Minié developed a conical bullet with a hollow base that when fired, sealed against the barrel wall. This really improved the accuracy of rifles and proved deadly in the wars of the mid 1800s, especially in the U.S. Civil War. The minie̕ ball provided the basis for modern bullets, and with the development of smokeless powder, modern rifles became more powerful, accurate, and lethal. Next we’ll study the details of each type of rifle action.